Most modern commerce platform that is built entirely for today’s experiences. An open source ecosystem offering every shoppable experience, not just the web shopping cart. Only commerce platform sturdy enough for both consumer and enterprise use cases. Joined capabilities of Magento and Adobe will give excellent results. Magento will contribute its digital commerce, order management, and predictive intelligence whereas Adobe is an expert in designing and digital data and content. The merger of these two will provide experience-driven ecommerce options. New technology and agility of the Magento Commerce Cloud will complete the customer experience loop for Adobe. This is going to make Adobe a formidable competitor to SAP, Salesforce, and Oracle. Although such assumptions are being articulated in the market, only the future will uncover the correctness of these assumptions. It’s too early to proclaim things. Lots of analysis been done on the possible outcomes of the merger and what next to expect in the joining of these two giants. Let’s take a look on that what possibilities this acquisition presents. Adobe and Magento are two different technologies and separate systems. These two will coexist with custom solutions or Adobe’s commerce framework. As Adobe has done before, they make smart decisions in acquiring and then integrating the new tech in their own systems. 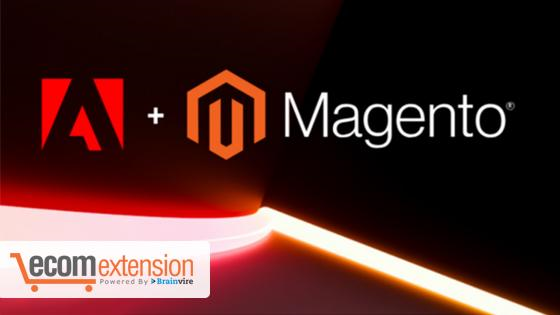 Adobe will have an opportunity to leverage the community of Magento and Magento will have to keep up the pace with technological innovations of Adobe which sets Adobe apart from the rest. It is very difficult to assume as of now how much success both will achieve in attaining these possible positive outcomes and we will have to let the future tell us. As of now, Adobe thrives in serving the enterprise customers whereas Magento capitalizes the mid-market. Regardless of whether they decide to make a dominant presence in both the markets or focus on only one, the customers are going to take time in their decision before investing for sure. With the addition of the commerce component, Adobe is certainly going to benefit in the future when customers will make their decision to make an investment. But in these early days of the acquisition, Adobe’s experience-driven business will continue to thrive and put it ahead of the competitors. This is going to be an interesting mix.